﻿﻿﻿As summer slips into fall, it’s time to scan the garden for needed pruning and decide what to bring inside for seasonal decoration—pumpkins, gourds, dried flowers, branches, foliage and berries. In my garden, tree leaves are preparing to turn color and drop, creating weeks of regular cleanup work, but also providing accents on table cloths and carpets. Yes, I scatter colorful leaves on the carpet and the table in the dining room as part of the floral and foliage arrangements for special dinners. The idea usually prompts surprise and delight and is easy to cleanup. Now is also the time to think about what to plant in late fall after the soil cools down in California. Monrovia nursery has a new Snowberry variety that’s promises to be a delightful way to bring branches into your home. Snowberry is a small genus of about 15 species of deciduous shrubs in the honeysuckle family, Caprifoliaceae. In fall, the leafless branches are loaded with big berries that last a long time. Established varieties include Scarlet Pearl Snowberry, which has an abundant crop of large pink fruit beginning in fall, becoming especially showy on the otherwise bare stems in winter. 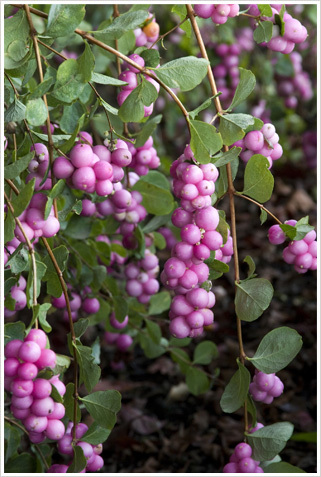 Bright Fantasy™ displays big white berries or Charming Fantasy™ with soft pink berries. Start preparing now for your winter garden. It’s a good time to think about the next growing season. I planted purple butterfly bush a couple of years ago and it’s doing nicely in full sun, attracting butterflies, hummingbirds and bees. Speaking of bees: the U.S. Fish and Wildlife Service just announced it’s considering listing “Franklin’s bumble bee” under the Endangered Species Act. It has the smallest distribution of any bumble bee in North America and perhaps the world, traditionally found in southwestern Oregon and in Siskiyou and Trinity counties in northern California. 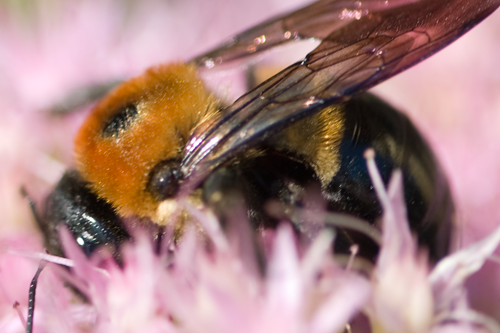 The last documented sighting of the Franklin’s bumble bee was in 2006. Creating a bee friendly garden supports a healthy urban environment, very important at a time when bee populations are plummeting. The Fish and Wildlife Service was petitioned to list the Franklin’s bumble bee under the ESA by Dr. Robbin Thorp, professor emeritus, Department of Entomology, University of California at Davis, and the Xerces Society for Invertebrate Conservation last year. The Society has a new book out that’s a must have for those who value worker bees and healthy gardens. 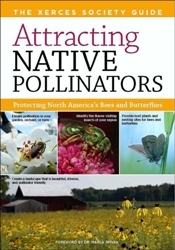 At 380 pages, Attracting Native Pollinators reflects the latest understanding about creating and managing pollinator habitat. Illustrated with hundreds of color photographs and dozens of specially created illustrations, Attracting Native Pollinators includes sections on bees of North America that helps with identifying the more abundant and important bee species and creating a Pollinator-Friendly Landscape that shows how gardens and farms can be enhanced to support diverse pollinator populations. ﻿ In addition to gardens, bumble bees pollinate crops grown in orchards, greenhouses and open fields, including tomatoes, peppers, cucumbers, eggplant, and different berries. They also are used commercially for pollinating flowering plants. In the wild, they play an important role in the food chain; for example, some of the plants they pollinate produce berries that serve as a food source for other wildlife such as birds and bears.